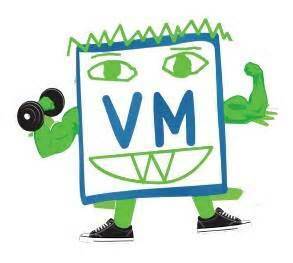 Remember when we thought that 32 vCPUs and 1TB of memory was a “Moster VM”? Well…it still is. However, with applications demanding more resources (think big data or intensive transactional apps), VMs will continue to consume larger chunks of the underlying hardware. With VMware aiming to run any application on their platform, they have continued to build super scalability into the product. vSphere 6 blows past the days of the fierce Monster VM and doubles, triples, even quadruples the limits of the previous 5.5 version (see VMware’s chart below). You can now provision VMs with 128 vCPUs and 4 TB of memory! 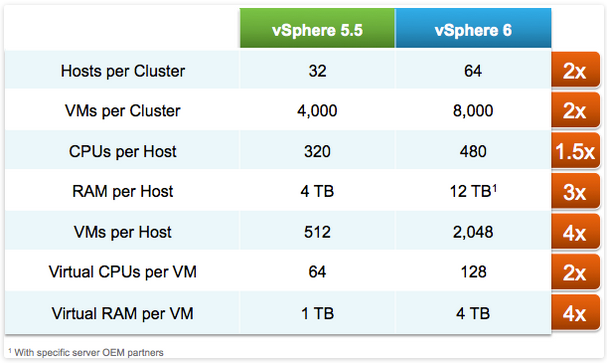 I’m not sure what the host would look like, but the bottom line is vSphere is built to handle it. These are some incredible leaps beyond the previous version. Delving back into the archives, it’s fun to see how far VMware has come over the last ten years. Below is a table showing their progression since the earlier days of GSX 2.0. For simplicity, I’ve added an additional breakdown of all the known configuration maximums for vSphere 6. I’m still waiting to see storage, network and resource pool maximums and will update those as they become available. Of especially important significance is the increase of vSphere FT jumping from its hard limitation of 1 vCPU to 4 vCPU. Finally, the more critical applications that often demand the higher resource capacity and have zero tolerance for downtime, can now be fully protected. vSphere 6 brings additional scalability enhancements such as vMotion between data centers and hot add memory support for NUMA nodes. More to come on these! For more information, read VMware’s What’s New in the vSphere 6.0 Platform or find additional links on my vSphere 6.0 Announced! page.